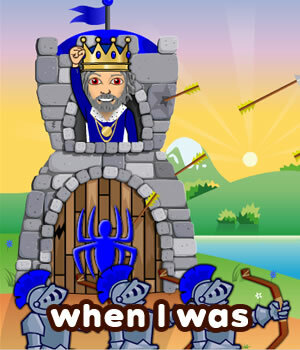 To teach ESL/EFL young learners how to talk about the past in the most basic form. 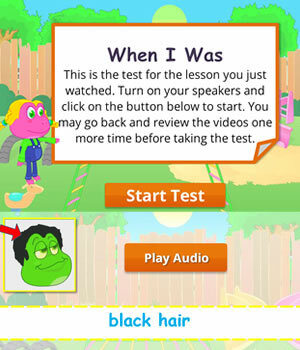 To teach the simple past tense with a particular focus on auxiliary verbs (to be, to have) and the modal verb, ‘can’. 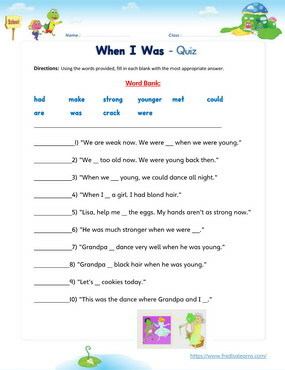 This lesson is meant to explicitly introduce the concept of the simple past tense in English. This kids English lesson also teaches learners a few adjectives for describing physical appearance. The worksheets below are useful for offline and classroom activities. 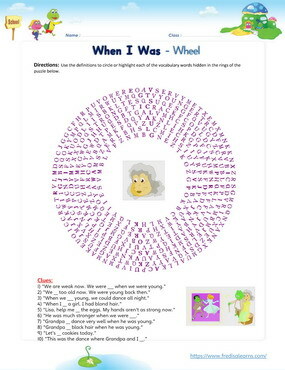 These printable exercises directly correlate with the above lesson 'When I was'. Every worksheet comes with an answer sheet on the second page for educators. Freddie and Lisa are visiting their grandparents. Today they are going to be making cookies. They follow grandma’s instructions on how to make the cookies. Grandma and Grandpa are not as strong as when they were young, so they let Lisa pour the mixture. They tell Lisa and Freddie the things they could do when they were younger and the kids have fun looking at some photos of their grandparents when they were younger. 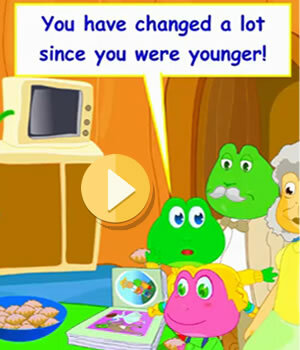 I am too old now. I was very young back then. I am weak now. I was strong back then. We are too old now. We were very young back then. I cannot run now. When I was younger, I could run very fast. We cannot dance now. When we were younger, we could dance very well. When I was your age, I could dance very well. Lisa: Grandma and Grandpa, it’s so good to see you! Lisa: What are we going to do this week, Grandpa? Grandpa: I thought we would make cookies today. Freddie: Awesome! I love cookies! Freddie: Grandma, after we pour the mixture in, what do we do? Grandma: You have to crack the egg and put the egg in the bowl. Grandma: Now, when I was a girl, I could mix the cookie mixture. But as I’ve gotten older, my hands aren’t as strong. Lisa: I can do it for you, Grandma. Freddie: What else did you do when you were younger, Grandma? Grandma: Well, I loved to swim. I was a very good swimmer. Lisa: But you don’t swim now. Grandma: No, I’ve gotten too old to swim. I also used to run. But I don’t do that anymore. Lisa: What did you look like when you were young, Grandma? Grandma: Well, now I have gray hair. But before I had gray hair, I had blonde hair. Freddie: What color hair did Grandpa have? Grandma: Grandpa had black hair. Grandpa liked to swim too. Lisa: I didn’t know Grandpa could swim! Grandma: He was much stronger when we were younger. Grandma: This was the dance where Grandpa and I met. I was younger then. Grandpa: When I was that age, I could dance all night. Lisa: Did you and Grandma dance together? Grandpa: We did. We don’t dance very much anymore. Grandma: No, our knees don’t hold up like they used to. Freddie: You have changed a lot since you were younger!